As China Goes Green What Is Canada Waiting for? China's government has realized the importance of clean energy to the very survival and health of many thousands of citizens per year and the economy. China is now making huge strides to properly address it's environmental challenges and there is nothing stopping Canada from doing the same -- except ourselves. Could it be that the world's largest emitter of greenhouse gas is the same country that spends more on green technology than any other country? It says everything about China that a nation of 1.5 billion people enjoying a rapidly growing economy chooses to spend unimaginably large sums of money to green-tech it's industry -- even as many competing domestic interests vie for government revenue. Beijing residents rarely see the sky these days due to constant smog caused by coal-fired power plants, industrial pollution, transportation and construction sectors. Many cities in China are finding themselves completely blanketed by thick, particulate-laden clouds. At a certain point, smog begins to affect worker attendance and productivity rates -- which affects the corporate bottom line. According to CLPmag.org: "It has been estimated that 410,000 Chinese die as a result of pollution each year." That's every year, folks. It is a vicious circle. High pollution levels induce worker ailments, which lower productivity, resulting in lower profits. This causes companies to demand the government apply stricter environmental standards. Company directors are beginning to recognize the costs of inaction are much higher than the cost of environmental action. 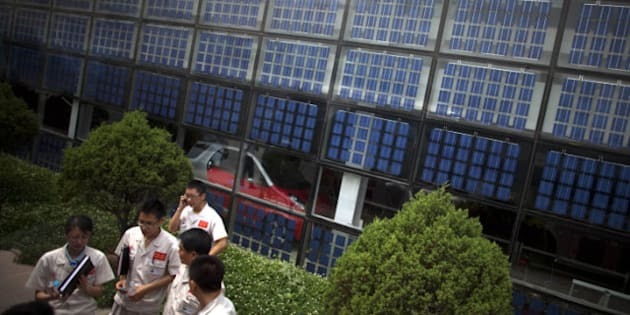 China is now the largest producer of solar panels in the world, having surpassed the U.S. in late 2011. A smaller percentage of those panels are available for export as they are being redirected for domestic use as a way to taper the need for more coal-burning power plants. However, on account of the staggering demand for electricity caused by rapid growth in China, completion of one coal-fired electrical power generation station per week continues and has been the case since 2008. One must also keep in mind this significant number; for each tonne of coal burned, around 2.4 tonnes of CO2 is created. 1) A Concentrated Solar Power (CSP) solar power plant -- which cost around $700 million in 2010, but are steadily dropping in price. Fuel cost for the sun to power those curved mirrors is zero. CSP's are noted for producing solar power 24 hours per day, storing the heat generated in vast underground pools of molten salt. After manufacture and construction, all emissions are zero. They are low maintenance. Note: A 100 MW CSP power plant saves the environment 164,000 tons of CO2 per year! 2) A Photovoltaic (PV) solar power plant -- generally cost around $300 million with prices dropping almost monthly. Fuel cost for the sun to power those solar modules is zero. After manufacture and construction, all emissions are zero. Very low maintenance. Note: A 100 MW PV power plant saves the environment 164,000 tons of CO2 per year! A coal-fired power plant -- cost about $250 million and that price is rising yearly as expensive environmental technology is added to improve air quality. Constant maintenance is a factor with coal-fired power plants. In the coal power plant scenario, the construction cost is only one factor out of many high costs to be borne by the plant operator and ultimately passed on to the consumer. At the end of 2010, China operated 620 coal-fired power plants burning over three billion tons of coal per year. That's a lot of CO2, sulphur dioxide, nitrous oxide, airborne mercury, other toxins and particulate. After manufacture and construction, just the CO2 emissions only amount to 7.2 billion tonnes -- every year. And, except for nitrous oxide (due to an aggressive and successful Chinese government program to drastically reduce NOx levels) all those numbers will double by 2020. Then there is the fuel equation: in China, coal costs 815 yuan ($125) a tonne and it burns over three billion tonnes per year to total $375 billion annually. Rail and shipping costs are extra -- which represent a substantial amount of money alone. Some of China's coal supply comes all the way from western Canada and the U.S.! Significantly, those numbers are expected to more than double by 2020. That is a lot of money to spend year in and year out, even for the world's number one economic performer. Which brings us right back to 410,000 deaths per year in China due to the environmental degradation of the air, water, land and even food. Is it any wonder that China is more determined than any country to pursue green-tech solutions to improve it's environment? In first-world nations, delivering on the environmental front is seen to be one step up from receiving a Cub Scout badge. In China, delivering on the environmental front means saving tens of thousands of lives every year along with accumulating healthcare savings. Is it any wonder that China's government has displayed such a high level of interest in promoting a green energy policy? China's government has realized the importance of clean energy to the very survival and health of many thousands of citizens per year and the economy. Although late entering the game, China is now making huge strides to properly address it's environmental challenges. There is nothing stopping Canada from doing the same -- except ourselves.